The building was constructed in 1836 by the Bavarian engineer Von Weiler. For a long period it was used as a military hospital and later, as the Gendarmes' Barracks. In 1978 it was offered to the Ministry of Culture and in 1985-87 was repaired in order to serve all its present functions. The museum organizes educational programmes for students of primary and secondary schools, but also houses congresses and other activities in the lecture hall, as well as temporary exhibitions. Workshops and storerooms for the casts are installed on the basement of the building. Casts of pedimental sculptures from the Parthenon. Sculptures of the west pediment, representing the competition between Athena and Poseidon. Casts of pedimental sculptures from the Parthenon. Sculptures of the east pediment, representing the Birth of Athena. Casts of the metopes of the Parthenon representing Amazonomachy, Gigantomachy, Centauromachy and scenes from the Trojan War. Casts of the Parthenon frieze. The reliefs represent the Panathenaic Procession, the most formal religious festival of Athens. Terracotta horse head. Two fragments of a terracotta horse head, hollow inside. It was probably part of an acroterion or a votive complex. Inv. no. 4923a-b. Terracotta female statue. Clay statue of a seated female deity, probably the corner acroterion of a temple. The lower part of the body is preserved, from the level of the thighs, with the left foot intact, on a thin, square plinth. Inv. no. 30. 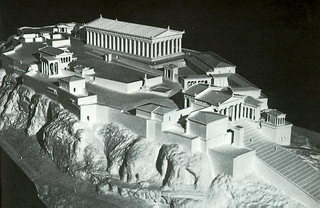 Model of the Acropolis, representing the hill of the Classical period. Drawings and photographs concerning the restoration of the fifth column on the south side of the Parthenon. Painted representation. The facade of the Paropylaia is shown as it was in the Classical period.